Shane and I received a very warm reception, broad smiles, and everyone needed a bear hug. This is the first time that Shane has started a first session (the beginning of the two weeks of teaching) – Neal has always come the week before Shane – so naturally, we took our cue from Neal’s play book. We asked what has happened in the lives of these pastors over the past year – challenges and blessings. 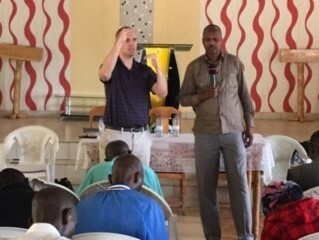 We heard about communities that see our churches as so important, that they were only closed for one week (the local magistrate ignoring Kigali’s new church building codes), others that worked hard and came into compliance quickly, and some that have received the needed materials and are proceeding with work. We found that the churches that are open, now host up to four congregations in the single building – while their home churches work to re-open or start anew. There were marriages and babies. And lots of enthusiasm. Shane gave a brief (3 hour) OT history lesson – what kingdoms were in conflict with Israel and Judah (see below for a sampling), when and where they were taken into captivity, the roles and responsibilities of the prophets…. All of this is to provide a context for the presentation of the Minor Prophets. It still amazes me when I see these men and women – up there in age – scribbling frantically – making sure that they don’t miss anything. By the way – the “Minor” Prophets are not less important, they are just small books – and the name actually comes from the Christians in the 4th century. One of the pastors has been taken down with the flu, another was called away because one of his parishioners was mugged and is now in the hospital (we have never seen any evidence of violence). We and they roll with whatever comes – it is part of the adventure. I had the privilege of teaching the afternoon session – the Book of Joel. The people of Judah were living a self-indulgent lifestyle thinking more of oneself than God. They performed the sacrifices, ate the approve food and in general did all of the required tasks. They went through the motions, but the focus was on completing the task instead of worshiping God as the provider of all good things in their lives. God wants relationship with his people, but their hearts were not on him. Joel tells Judah that God uses many tools (including natural disasters) to discipline and call the people back to him. He also tells us that there will be consequences if they do not turn to Him – in Judah’s case, they will be taken and dispersed. Joel introduces the Day of the Lord – times when there is a decisive intervention by God in history. Joel’s coming Day of the Lord included the coming Babylon invasion and the future time when God’s judgment and redemption are consummated, the kingdom that will endure and flourish forever. Joel’s prophecy also describes the holy spirit coming onto people – Peter used his text to explain what was happening at Pentecost. It is really interesting to see how future events related to Jesus are woven in the OT scriptures. The God of the OT is our God and still wants relationship with us, He wants us to see him as the source of all that is good in our lives and to call on Him for our needs. Today, in our self-indulgent society, is this our reality? We put a lot of details in the teaching, interesting facts that are not critical to the message, but loved by the Rwandans. 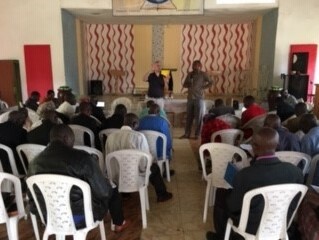 We completed teaching the book, tomorrow morning we have the Q&A, that is the more challenging part of the teaching – you never know what they will ask – they really are trying to understand, and yes, they enjoy the game “Stump the Pastor”.